The over 60s gave the eventual bronze medal winners Germany a run for their money in the opening game, leading 2-1 at the half way point in the third quarter. David Margerison's sending off for a stick tackle prompted a shift of gears from the Germans who scored two goals before the Scottish midfielder was back on the pitch. The superior strength and power of the Germans in the last quarter saw them score another two goals to finish the match 5-2 winners. 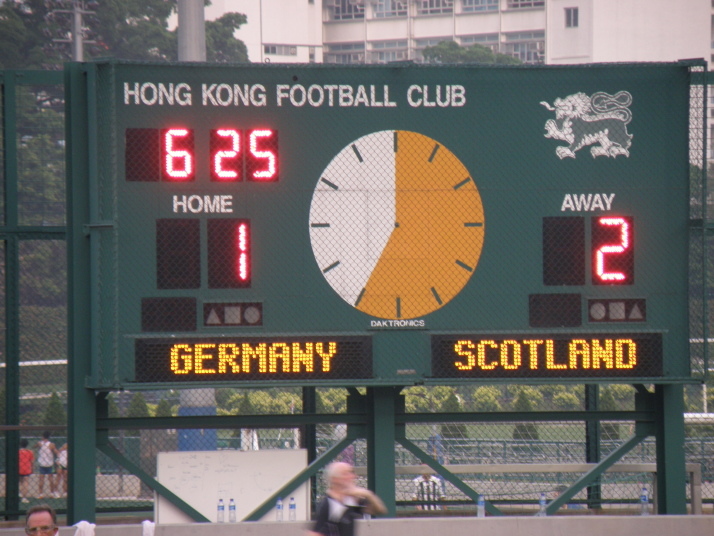 Scotland missed a great opportunity to qualify for the medal places through a poor performance against the hosts, Hong Kong in their second match. A creditable draw against South Africa with half the team suffering from stomach upsets left Scotland out of the semi finals and into the play-offs for 5th to 9th, carrying the result against South Africa into the play off stage. Scotland excelled with three straight wins in the 5-8 play-offs against Japan, Italy and Netherlands to secure fifth place by a margin. Scotland finished in fourth place in Pool B, level on points with South Africa but with a poorer goal difference. The one point for the draw against South Africa was carried forward into the play-offs for positions 5-9. The highlight of the tournament for the Scots was the final goal against Netherlands scored by full back Alastair McNab, who ran the whole length of the pitch, beating man after man, before firing an unstoppable shot past the Dutch goalkeeper.